Team Bath emerged from their Monday-night away trip to Surrey Storm with a win, a move back into the top four, a place in October’s Fast5 event at the Copper Box Arena and the opportunity to give a fuller squad on-court time. The victory was also a chance to avenge January’s home defeat to Storm. 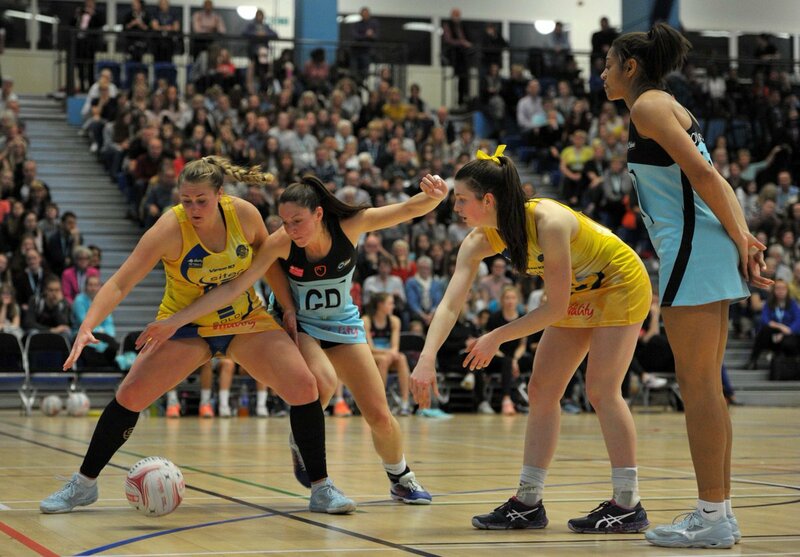 Laura Rudland, brought on early at wing-attack after a knock to Rachel Shaw, Leila Thomas, the Welsh defender in quarter three, and Abi Robson at wing-defence, in the final quarter, all enjoyed court time in the 48-57 victory – Team Bath’s sixth in a row. Team Bath Head Coach Jess Thirlby dubbed the victory “a big squad performance” against a Storm side she characterises as “always difficult to beat away from home”. The Sitec-sponsored Blue and Gold built a 5-1 opening lead only for Storm to pull the margin back to just two goals at quarter-time, 10-12. A roller-coaster second quarter must have given Head Superleague Coach Anna Stembridge a few grey hairs. Team Bath led by 20-15 but saw that margin crumble as Storm surged to a 24-22 lead before Bath pulled two back to go to half-time level at 24-24. In a game of twists and turns the third quarter proved the decisive with Team Bath adding eight unanswered goals as they came off the half-time bench. By three-quarter time the lead was 32-39 in Team Bath’s favour and despite a short-lived Storm fight-back the Blue and Gold, also supported by Mogers Drewett, Soldi and Centurion Chartered Financial Planners, drove onto victory. That leaves the stage set for the next home game when Team Bath take on Loughborough Lightning, coached this season by ex-Team Bathonian Sara Bayman, on April 12th at 7.30pm. Hardly the thickness of a credit card separates the two sides currently with both in the top four and each having 27 points alongside Wasps. Manchester Thunder top the table with 30 points. Before that home encounter, though, Team Bath take on Wasps away on Saturday April 8th with Loughborough at home to Storm in their next round.